Trying to find out what are peoples opinions on the APS and the GenTTR turbo kits. Currently have an 05 goat and am looking for the best possible kit. Also what would be a safe boost level on a stock engine? I wouldn't go with APS definitely. The Gen TTR kits seem to be hit or miss. Honestly, if you are going to spend the money for a kit, I would say to save up an extra couple thousand and get a custom setup built. ETMC a site sponsor, (Owners name is Stephen) can build one for you. It will then be built to your specifications and will fit properly without the headaches others are having right now. Besides the APS kit is no longer available for the GTO. The Gentt kit is probably the choice to go with if you are looking for an off the shelf kit, that you can still get parts relatively fast for. I would get a custom kit also. Why not a maggie or a procharger? Our sponsors can hook you up! Go Mods: Kooks, Spintech, HP tuners Self Tuned, Auto Swap, D1 Procharger and Epp Blower Cam 612RWHP 510rwtq on 7psi, P/B: 10.89 @ 125 (04-20-13) Hopefully a little faster soon! whatever you decided to go with we can hook you up with we are a dealer for ALL the FI kits on the market. If i were looking for a DD and a good reliable type i always say go with the maggie! if you REALLY want a turbo we can do a STS or the GENN TT BUT the GENN TT is a HEADACHE to install and do all the fab work. what ever you decided let us know we can get it for you! turbos,nitrous,superchargers,heads,cams,headers,CU STOM HEAD PORTING, anything!!!!! Send a private message to E.T.M.C. Find More Posts by E.T.M.C. If you are dead-set on an off-the-shelf kit, then do the Gen-TTR's. It's a ton of work to install it, but its' performance is much greater than most everything out there. Do that or a TVS. I had the Gen TTr on my ole goat. Stephen installed and did a great job, but it was a huge pain. Heck I didnt care how hard the install was lol that is why I paid him to do it. It was a blast to drive and put out great numbers. what are your plans for the car? I personally would rather go with a procharger over some of the other options. Looking to use the car for street and strip, planning on having the goat for a long time. Would rather stay away from a blower since i plan on eventually switching out internals and running high boost when i need to. Also would like to know what people think of the hahn twin turbo kit? if its even available or if anyone has it. With forged internals, a blower or a turbo will make great power. You just have to have a well thought-out set-up. A TVS2300 will make all the power that the GTO can put to the ground if you want it to and have the supporting mods. One thing you need to keep in mind is that the GenTTR set-up requires a lot of cutting to the car, etc... it sounds to me that you are leaning more towards a used APS kit. It's not a kit. It is custom built at their facility. 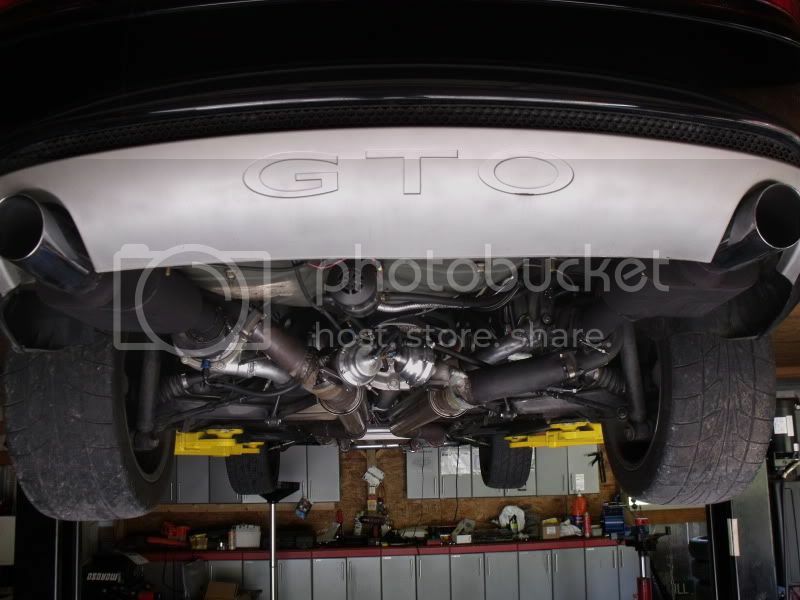 OHIOS 1st, only 9 second 04-06 gto,stock IRS rear end . built 408,Performabuilt 4l80 trans,Yank converter, custom built twin rear mount turbo setup. I as well as many others have ran 10psi or more for many miles,my stock ls2 is still in very good condition ,I pushed 13-15 psi through her for 3 seasons,the key is the tune. DFWGTO, Loyd, has a pretty good rear mount kit possibly for sale. STS is good up to about 600rwhp, then it is garbage. I have been fighting with my sts setup for over a year trying to make it work for the power I want and it just aint cutting it. I am actually gunna be selling my turbo kit minus the turbo here pretty soon and having a custom under the hood setup made. drive that thing to OHIO ,I help you get it sorted out,STSs are notorious for leaks.any system has it lil quirks,just gotta keep after them..
my sts kit we did makes over 600 whp and 700 foot lbs of tq and it is on pump gas and a dd car.. so the power can be made with the sts kit for sure.. Very clean setup. Any more pics?